“A newspaper is a business out to make money through advertising revenue. 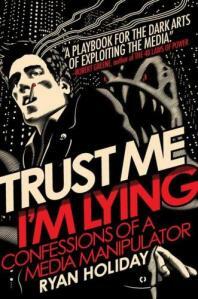 Ryan Holiday’s book Trust Me, I’m Lying: Confessions of a Media Manipulator, offers a penetrating look at the incentives of media. For me, the most interesting part of the book was the history of the press, which begins with the Party Press, moves on to the Yellow Press and ends with the Modern Press (aka Subscription Press). Holiday gives us this history lesson to explain how news outlets sold their product over the years. This first stage of journalism was limited in its scope and impact. Because of the size and nature of its audience, the party press was not in the news business. They were in the editorial business. It was a different time and style, one that would be eclipsed by changes in technology and distribution. Newspapers changed the moment that Benjamin Day launched the New York Sun in 1833. It was not so much his paper that changed everything but his way of selling it: on the street, one copy at a time. He hired the unemployed to hawk his papers and immediately solved a major problem that had plagued the party presses: unpaid subscriptions. Day’s “cash and carry” method offered no credit. You bought and walked. The Sun, with this simple innovation in distribution, invented the news and the newspaper. A thousand imitators followed. … He (James Gordon Bennett) knew that the newspaper’s role was “not to instruct but to startle.” His paper was anti-black, anti-immigrant, and anti-subtlety. These causes sold papers—to both people who loved them for it and people who hated them for it. And they bought and they bought. … The need to sell every issue anew each day creates a challenge I call the “One-Off Problem.” Bennett’s papers solved it by getting attention however they could. The first issue of Bennett’s Herald looked like this: First page—eye-catching but quickly digestible miscellany; Second page—the heart of the paper, editorial and news; Third page—local; Fourth page—advertising and filler. There was something for everyone. It was short, zesty. He later tried to emphasize quality editorial instead of disposable news by swapping the first two pages. The results were disastrous. He couldn’t sell papers on the street that way. The One-Off Problem shaped more than just the design and layout of the newspaper. When news is sold on a one-off basis, publishers can’t sit back and let the news come to them. There isn’t enough of it, and what comes naturally isn’t exciting enough. So they must create the news that will sell their papers. When reporters were sent out to cover spectacles and events, they knew that their job was to cover the news when it was there and to make it up when it was not. Does any of that sound familiar? It should. Just take a look at Gawker and The Huffington Post. It’s the modern version of the One-Off problem. Instead of trying to sell you a copy of the newspaper by shouting on the street corner, today’s media want page views. In yellow journalism, headlines and promotions were more important than content. He immediately set out to change the conditions that allowed the Bennett, Hearst, Pulitzer, and their imitators to flourish. He was the first publisher to solicit subscriptions via telephone. He offered contests to his salesman. He gave them quotas and goals for the number of subscribers they were expected to bring in. He understood that people bought the yellow papers because they were cheap—and they didn’t have any other options. He felt that if they had a choice, they’d pick something better. He intended to be that option. First, he would match his competitors’ prices, and then he would deliver a paper that far surpassed the value implied by the low price. Of course, the transition to the modern press wasn’t immediate. The subscription model, however, better aligned the incentives of the reader and newspaperman. Subscriptions change everything because readers who are misled unsubscribe. Content, not headlines, ruled the day. While subscription journalism meant you didn’t have to peddle papers on the street, that didn’t make it a perfect system. Newspapers are owned and published by rich men. Rich men all belong to the same club. Sure, there’s competition—hard tough competition for circulation, for newsbeats, for exclusive stories. Just so long as it doesn’t damage the prestige and privilege and position of the owners. We’ve had a good run. For a long time journalism was primarily sold via subscriptions (the stable press model) but now we’re moving quickly towards online à la Carte offerings. Journalism is no longer selling a package. Now each story is like a mini paper on the side of the street corner in the 1840’s trying to be heard over all of the other stories. Our bodies are programmed to consume fat and sugars because they’re rare in nature. Thus, when they come around, we should grab them. In the same way, we’re biologically programmed to be attentive to things that stimulate: content that is gross, violent, or sexual and that gossip which is humiliating, embarrassing, or offensive. If we’re not careful, we’re going to develop the psychological equivalent of obesity. We’ll find ourselves consuming content that is least beneficial for ourselves or society as a whole. … Each article ascends the most-forwarded lists or dies an ignominious death on its own…. The attention economy is ripping the binding, and the pages that get read are the pages that are frequently the most topical, scandalous, and viral. Think about how you consume media today. You don’t read one newspaper or blog. You read an assortment of many newspapers and blogs. And you don’t pay for any of it. The trust relationship is fractured. Competition centers around who can create the most read story. That means journalism becomes about what spreads – not what’s good. MIT Media Studies Professor Henry Jenkins gives publishers and companies the following advice: “if it doesn’t spread, it’s dead.” Spreading is traffic. Traffic is money. Basically, virality is determined by how much anger the article causes. Not all extreme emotions spread. Sadness doesn’t spread. Anger spreads. If anger spreads and financial incentives are somehow aligned to ‘page views’ more of our journalism will move towards what spreads. Something analogous to Gresham’s Law can be found in the One-Off problem. If each story has to find its own audience (i.e., it’s no longer sold as a bundle) and compensation is derived from page views, we can expect incentives to favor a lot of low-cost articles with catchy headlines. In the end, we’re likely to get the stories we want to read — not the ones we should read. If not part of subscription, we’ll likely lose the in-depth reporting we’ve come to expect from some of the old media guards. Still curious? If you want to know more about how the media is manipulated, read Trust Me, I’m Lying: Confessions of a Media Manipulator. The Filter Bubble, by Eli Pariser, puts forth an argument that we’re increasingly trapped inside an algorithm that filters our news based on what it thinks is best for us. In this case, IT is an algorithm. Computers and the algorithms they run are increasingly aware of the things we seem to like. They learn from what we click on and tailor results so we get more of what we like and less of what we don’t like. The equivalent would be parents giving their kids only sugar because that’s what they seem to like. Only parents know better, so they feed their kids what they need first with a sprinkling of what they want. Algorithms don’t. This means that two people googling the same thing are likely to see different results. The problem with this, Pariser argues, is that you’re not making a conscious choice to have your results filtered — it happens without your knowledge or consent. And that causes a whole host of issues, of which Pariser is primarily concerned with the social and political implications. When technology’s job is to show you the world, it ends up sitting between you and reality, like a camera lens. Consider for a moment where we are headed. If Google knows that I’m a democrat or republican they could now add a filter to my news to show me only the stories I’m predisposed to agree with. Based on their guess as to my education level, they may then tailor the article’s words and language to maximize its impact on me. In this world, I only see things I agree with and writing that I easily comprehend and that’s a problem. Google might know that I don’t read anything about Republican tax cuts or democratic spending so they might just filter those articles out. Reality, as I see it, becomes what the lens shows me. When asked about the prospects for important but unpopular news, Media Lab’s Nicholas Negroponte smiled. On one end of the spectrum, he said is sycophantic personalization — “you’re so great and wonderful, and I’m going to tell you exactly what you want to hear.” On the other end is the parental approach: “I’m going to tell you this whether you want to hear this or not, because you need to know.” Currently, he argues, we’re headed in sycophantic direction. Whether you believe the book’s conclusions are wholly convincing or not, it is worth thinking about. If nothing else, it is thought-provoking.